The reconstruction of a neo-rococo finial, which is the closing element of a ceramic stove, the resolution of a story told in plastic form on the stove’s body. 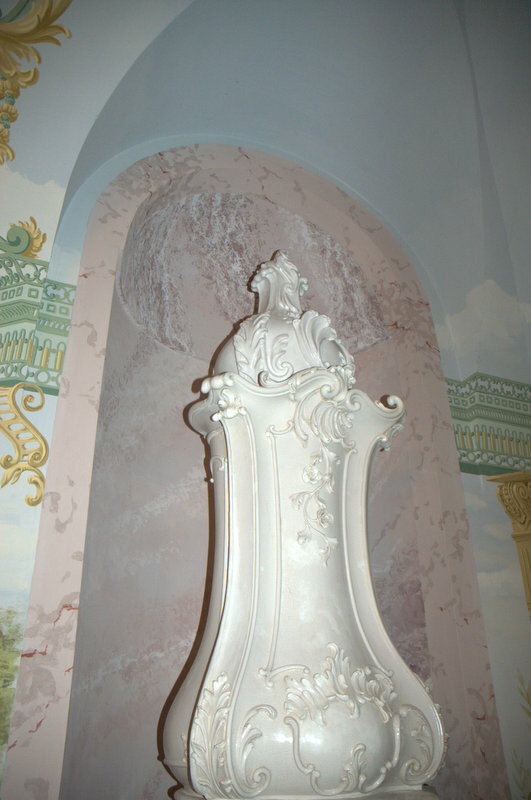 Found in the stylistically eclectic Szapáry castle, its original creator’s identity remains unknown. Aside from identifying its stylistic period, the stove’s decoration offers no further information. As such the new finial is a variation of the existing themes found on the stove’s body. The stove was rehabilitated and its missing pieces recreated as part of the historical building’s reconstruction and interior renovation. Historically, the design of finials for masonry stoves always continued the stove’s architectonic rhythm and decorative language. Therefore the finial’s shape, decorative motifs, and plasticity were derived from the stove’s so called appliquéd decoration, and its structural logic. The peak of the finial was historically a more freely formed “signature”, and as such the completed finial’s peak is one of many possible variations. In addition to the assessment of its context and its formal design, one of the most important assignments was to recreate a glaze as similar as possible to the original. Over time it had cracked and soot from use had given its satin finish a greyish tone, providing the technical challenge of mixing a matching hue.